Apple's new HomeKit tools for developers won't come with a centralized app like Health or Passbook, instead leveraging the ability of the iOS voice-driven personal assistant Siri to allow users to control the temperature, lights, locks and other accessories in a modern "smart home." 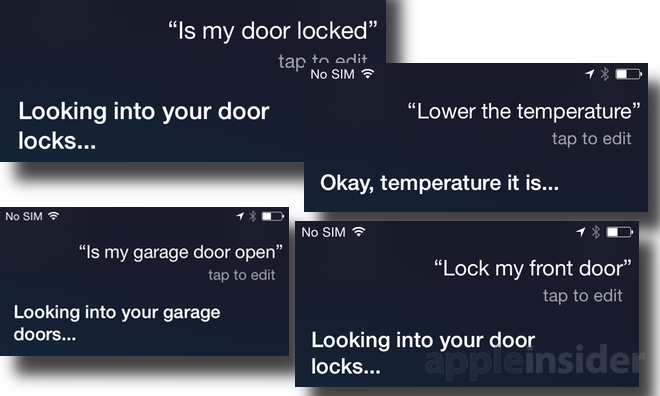 With iOS 8 still in beta, HomeKit support within the operating system is limited, and a lack of available third-party apps means the controls cannot yet be tested. 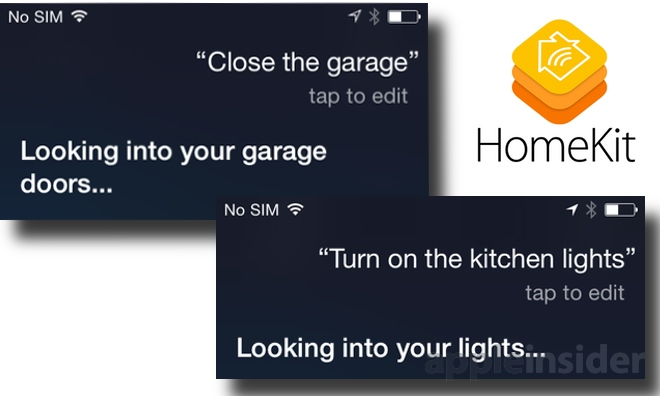 But Siri already responds to some HomeKit-related commands. The current responses from Siri in iOS 8 beta 2, and details revealed by Apple at this month's Worldwide Developers Conference, do give a glimpse into exactly how HomeKit will work with the virtual assistant. For example, users will be able to use natural voice to issue commands such as "lock my front door" or "turn on the kitchen lights." But Siri will also be able to provide users with the status of objects in their home, handling queries such as "is my garage door open?" At the moment, without any compatible third-party apps freely available, Siri simply responds with the error "Sorry, I tried by the request failed." As Apple detailed to developers earlier this month, built-in HomeKit services include garage door openers, lights, door locks, thermostats, IP camera controls, switches and more. These individual accessories will have unique characteristics such as current power state, lock state, brightness, and current temperature. The goal of HomeKit is to unify and simplify the control of smart home accessories, but Apple won't be doing this with a dedicated app. Instead, developers will still have to make their own third-party tools to control smart home accessories, but now those apps will be able to hook into Siri to allow unified control without the need to manually select apps and settings. But Apple admitted to developers at WWDC that it cannot possibly imagine all of the unique implementations of HomeKit that developers may dream up. While common accessories such as connected light bulbs or thermostats may be obvious, some hardware makers could build more unique options that might not fit into predefined smart home categories. 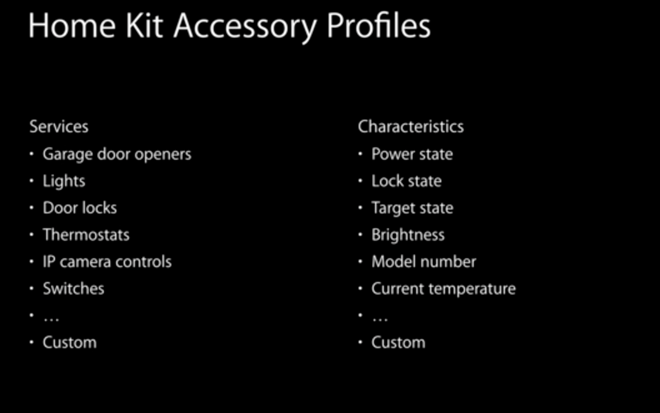 With that in mind, Apple has given developers the ability to create and define their own accessory categories. "We don't want HomeKit to be restricted and contained. We want HomeKit to create innovation and creativity," Kevin McLaughlin, a software engineering manager at Apple, explained in a HomeKit WWDC presentation earlier this month. Users won't even need to be on the same Wi-Fi network to access and control their HomeKit accessories. Apple has also baked remote access into its system, which ensures users will be able to check whether they locked the front door or closed the garage —and fix it if they didn't— when they are away from home. Security is also a key focus for Apple. HomeKit includes end-to-end encryption between iOS devices and accessories. In addition, the HomeKit API requires that applications in use be in the foreground, so that the user knows exactly what app is controlling their devices at home. 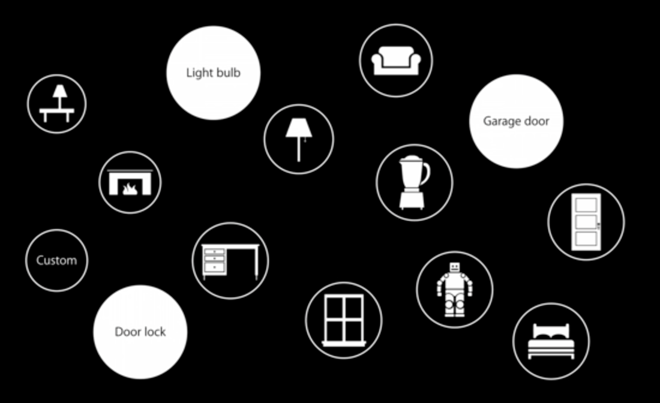 HomeKit supports multiple homes, so users will be able to control accessories at a variety of locations if need be. Each home contains not only accessories, but names of specific rooms that are saved within the HomeKit settings. Once individual rooms and accessories are identified through HomeKit and third-party apps, Apple's Siri can then recognize and control them. This allows users to issue commands such as, "lock the front door." HomeKit will debut with iOS 8 on iPhone, iPad and iPod touch, which is scheduled to become available this fall. Developers will need to release new or update existing apps in order to tap into the power of HomeKit, which is the purpose of the current beta period.